Oral ulcerative mucositis is a common, painful, dose-limiting toxicity of drug and radiation therapy for cancer. It is characterized by breakdown of the oral mucosa resulting in the formation of ulcerative lesions. In granulocytopenic patients, these lesions are frequent portals of entry for indigenous oral bacteria, often leading to sepsis or bacteremia. Mucositis occurs to some degree in more than one third of patients receiving anti-neoplastic drug therapy. It occurs in almost all patients undergoing radiation therapy for cancer of the head and neck as well as a high percentage of patients undergoing bone marrow transplantation. Currently, supportive care is the primary treatment option for mucositis. Patients can be prescribed analgesics for pain relief and are instructed to maintain good oral hygiene to mitigate risk of infection. Experimental compounds which modify cytokines or otherwise protect tissue from radiation or chemotherapy exposure may be efficacious for mucositis. Hamsters provide an excellent model for oral mucositis because of several biological similarities to humans. Furthermore, the cheek pouch is pliable and can be extracted, allowing for radiation to be targeted to the cheek pouch while the rest of the animal is shielded. The result is formation of ulcers on the cheek pouch approximately 16 days following radiation. 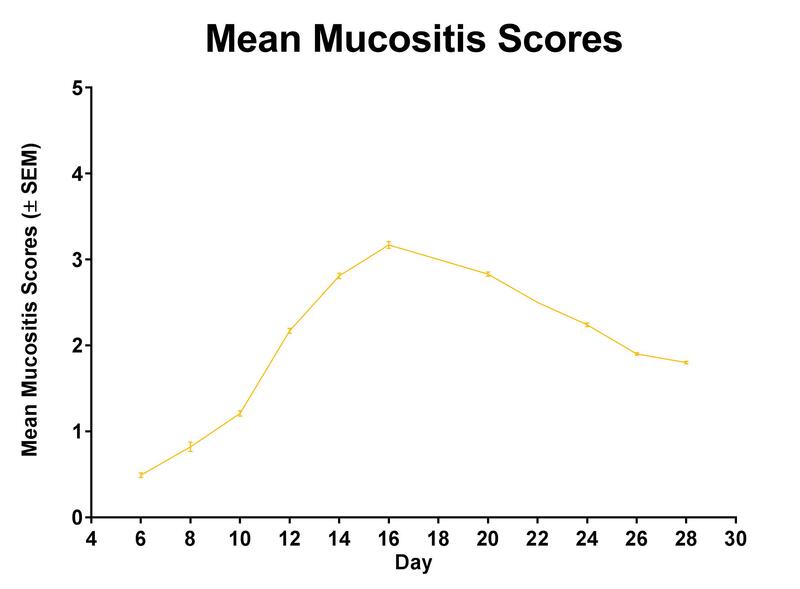 Primary end points in this model include mucositis scores based on a standardized scale and analysis of the frequency and duration of ulcers. Patients often undergo several treatments with radiation. Therefore, to model the human treatment cycle, Biomodels has developed a fractionated radiation protocol for hamster mucositis. In this protocol, the radiation treatments are divided into eight fractions over two, four-day cycles. Like in the acute model, this results in the formation of ulcers on the cheek pouch, however, the length of fractionated radiation studies is typically longer. Primary end points include mucositis scores based on a standardized scale and analysis of the frequency and duration of ulcers. In many cases, patients receive both chemotherapy and radiation therapy. Therefore, Biomodels has optimized the radiation protocol for use with combined chemotherapy. The endpoints and study duration are similar to the fractionated radiation protocol, but the expected development of mucositis is more severe. In some cases, it is advantageous to study more common laboratory animals such as rats or mice. Therefore, Biomodels has developed an acute radiation model of mucositis in these species. In this design, radiation is focused at the tongue (mice) or snout (rats). The tongue is then evaluated, photographed, and scored based on a standardized scale at established time points. Mucositis is known to occur in approximately one third of patients receiving chemotherapy treatment. Biomodels has modeled chemotherapy induced mucositis in rats by combining chemotherapy administration with a small injury to the tongue. 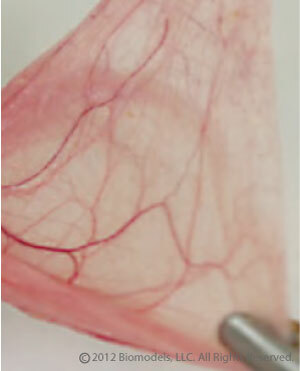 The result is an inflammation of the tongue that peaks at 5-7 days post-induction. The primary endpoints in this model include scoring the injury of the tongue according to a standardized scale.